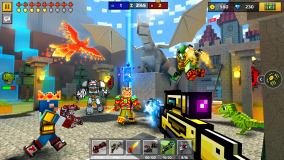 Pixel Gun 3D is just not your other run of a mil shooting experience game. With this game you will b able to get rewards from mines. Do crafting in lobby, and on top of that play mini games like ‘Cops & Robbers’. The game allows you to do various activities like forming your own clan like in clash of clans. building your own fort and all the while combating on different maps; no matter day or night on any of you mobile devices. 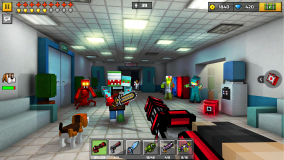 Pixel Gun 3D is a pocket edition especially for mobile phones. With this you will have an opportunity to battle with your friends, classmates and colleagues or you can also battle it out with people around the globe. The game allows user to not only create their own player but also customize them with in-app special skins and show them off on the battlefield. The game is one a kind FPS shooter game for every player type. 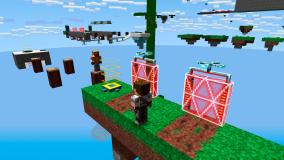 Pixel Gun 3D has the multiplayer mode in which you can play Death match. The Death match gives out following benefits. Offers versatile weaponry options. Users can choose from a range that features some like a Magic Bow, Combat M16 Rifle, Golden Desert Eagle pistol and even a cool light saber. Or if you like a little something calmer, you can also use a knife to butcher someone. With the new in-game chat feature, fiends can easily communicate between the gameplay. In the Battle Royal mode, you can show out your skills to the world and be the last survivor. This Battle Royal mode offer users with a large scale battleground hat is enriched with expensive materials wafting to be looted on a never ending action map. Users can feel free to open fire randomly on the map on their sight as it is filled with a frenzied dozens of players. 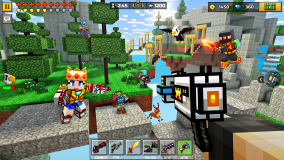 The Cooperative mode of Pixel Gun 3D comes with following features. 4 players can play at a time. This story mode of the game offers the players to engage in a battle with hordes of zombies that are attacking from all sides. In addition to that there are a lot of other opponents in form of cops, robbers, nurses and swat members. You need to wipe them out otherwise the impending doom awaits you. The only task which is undoubtedly not that easy is to kill all monsters. Don’t let the fear grow inside your head. The zombies are not your only worry as after defeating these zombies you will face the Evil Zombie Boss in this mode’s end. After mince meating this boss, you can open a portal and enter the next battle field. 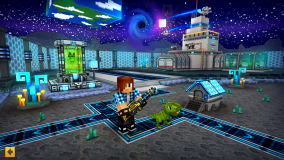 What's new in this version of Pixel Gun 3D? And also significantly improved the optimization of the game and finalized the control settings.